Orca Gold Reports Continued Success | Orca Gold Inc.
VANCOUVER, BRITISH COLUMBIA--(Marketwired - May 26, 2014) - Orca Gold Inc. (TSX VENTURE:ORG) ("Orca" or the "Company") is pleased to provide an update on exploration at its Galat Sufar South ("GSS") prospect on its Block 14 mineral license in Sudan. (see Appendix A for plan map of Block 14). Prospective mineralization has been intersected at numerous targets within 2km of the current GSS Mineral Resource and this release highlights recent results from nine of these targets. The discovery of these occurrences supports the significant potential to increase the size of the resource at GSS. On January 29, 2014 Orca announced an initial Mineral Resource at GSS comprising Indicated Resources of 22.2MT at 1.84g/t for 1.3 million ounces of gold and Inferred Resources of 6.5Mt at 1.9g/t for an additional 0.4 million ounces of gold. Since January, exploration has focussed on expanding the GSS resource base through an ongoing program of surface (trench and chip channel) sampling and preliminary drilling of new targets. Exploration over the last four months has included 7,410m of trenching, 1,741m of continuous chip channel sampling, 6,379m of reverse circulation (RC) drilling in 53 holes and 967m of diamond drilling (DD) in 5 holes. The result of this work since January is the identification of 9 new targets which show real potential of adding to the already impressive resource inventory at GSS. Recent exploration has identified gold mineralization in two zones, 500m apart. In the southwest zone, GSRC307 (reverse circulation hole) intersected 17m grading 8.20g/t (17m @6.21g/t cut) (from surface) and 10m at 2.42g/t whilst in the northeastern zone GSRC336 (reverse circulation hole) returned +1.4 g/t results over numerous and material widths. Carbonate Ridge is a new style of mineralization at GSS with gold grades associated with silicified and dolomitized carbonates interbedded with volcanic schists. Surface work and drilling at the Gap target between the Main Zone and the East Zone at GSS has intersected north-south trending mineralization, including higher grades, over significant widths. The Gap target is a separate north-south trending domain within GSS which remains open on strike. Drilling at the East of East target, close to the eastern margin of the GSS resource, has intersected good grades and widths, including a high of 24m at 3.03g/t (24m@ 2.78g/t cut) in GSRC301. Three sections, 50m apart, were drilled at East of East based on strong results from trench and chip channel sampling. East of East also represents a new style of mineralization at GSS with grade hosted in diorites containing a fine stockwork of thin quartz veins. Mineralisation is interpreted as being vertical and is open to the south. To the west of the GSS resource, at Target G, exploration has defined mineralization over a strike length of 100m, open on strike in both directions. 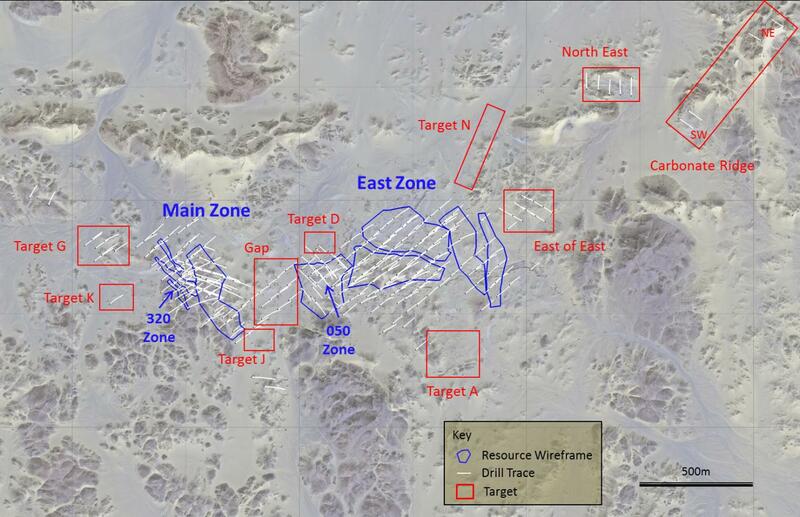 This new mineralized zone runs parallel to the 320 Zone within the GSS resource. At Target K, a single hole drilled below a trench intercept of 20m grading 1.24g/t, returned 40m grading 1.57g/t. These results support the presence of a further, parallel zone, lying south west of the 320 Zone of the GSS resource. At the North East target, recent trench results of 30m at 1.55g/t and 24m at 1.21g/t have extended mineralization identified in earlier drilling. Further surface sampling is underway. At Target N initial trenching has defined a northeast trending mineralized zone which is now being followed up along strike. At Target J, three trenches were excavated to follow up on a high grade drill intercept in GSRC103 of 16m grading 8.47g/t (16m @ 5.57g/t cut) on the southern margin of the GSS resource. These trenches returned 18m at 2.79g/t, 22m at 3.61g/t and 26m grading 0.47g/t, respectively, and highlight new east-north-east trending mineralization in this area. 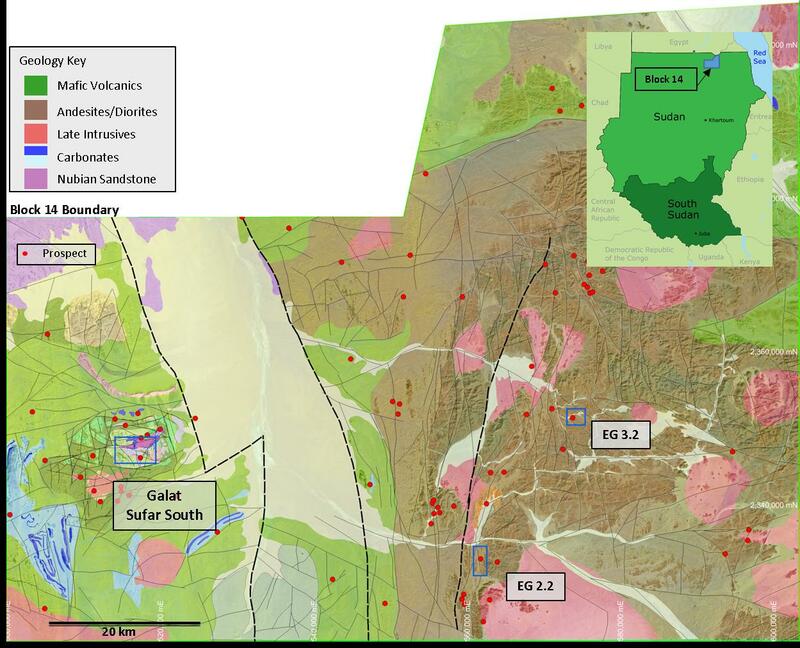 At Target A, 300m south of the GSS resource in an area of similar alteration and artisanal mining activity, surface sampling has defined a north west trending mineralized zone. Commenting on the discovery of numerous targets in close proximity to the Galat Surfar Resource area, Simon Jackson, President and CEO, said, "Our latest new target identification program at Block 14 supports the real potential to expand the GSS resource. We are excited by the number and quality of these new targets and in a new exploration program will work to rapidly assess the potential of these targets towards adding to the Initial Mineral Resource at GSS. Orca is an enviable position to continue exploration at GSS and at our new high grade EG3.2 discovery on Block 14, (News Release: May 12, 2014) with a solid balance sheet of over $40 million in cash. We look forward to expanding GSS and working towards an initial resource estimate at EG3.2." This press release contains "forward-looking information" within the meaning of applicable Canadian securities legislation. Generally, forward-looking information can be identified by the use of forward-looking terminology such as "anticipate", "believe", "plan", "expect", "intend", "estimate", "forecast","project", "budget", "schedule", "may", "will", "could", "might", "should" or variations of such words or similar words or expressions or statements that certain events "may" or "will" occur. Forward-looking statements in this press release include, but are not limited to, statements relating to indicates and inferred mineral resources, the potential to expand the resource targets in the Main and East Zones, the plans of the Company to conduct preliminary metallurgical testwork and increase its ownership in Block 14 and the future potential of GSS to become a commercial mining operation, including exploration activities. Forward-looking information is based on reasonable assumptions that have been made by the Company as at the date of such information and is subject to known and unknown risks, uncertainties and other factors that may cause the actual results, level of activity, performance or achievements of the Company to be materially different from those expressed or implied by such forward-looking information, including but not limited to: risks associated with mineral exploration and development; metal and mineral prices; availability of capital; accuracy of the Company's projections and estimates; interest and exchange rates; competition; stock price fluctuations; availability of drilling equipment and access; actual results of current exploration activities; government regulation; local political instability or unrest, local economic instability; global economic developments; environmental risks; insurance risks; capital expenditures; operating or technical difficulties in connection with development activities; personnel relations; the speculative nature of strategic metal exploration and development including the risks of diminishing quantities of grades of reserves; contests over title to properties; and changes in project parameters as plans continue to be refined. Forward-looking statements are based on assumptions management believes to be reasonable, including but not limited to the price of gold; the demand for gold; the ability to carry on exploration and development activities; the timely receipt of any required approvals; the ability to obtain qualified personnel, equipment and services in a timely and cost-efficient manner; the ability to operate in a safe, efficient and effective manner; the expected timing, costs, and results of a PEA; the expected burn rate; the regulatory framework regarding environmental matters, and such other assumptions and factors as set out herein.